The fall election whirlwind and holiday break are over, and Brampton councillors are returning to the table to deal with a lot of unfinished business left over from 2018. Today’s committee of council meeting will include discussions on key topics that will have widespread impact on the city. As council sits down for its first official main-committee meeting of the new year starting at 9:30 a.m., here are the big topics expected to dominate the discussion. Added to council’s agenda today at the request of Councillor Rowena Santos, the discussion will centre on Ryerson University’s Chang School satellite campus. Council was assured during a special meeting in November by Ryerson Deputy Provost Glenn Craney that the continuing education school, to offer limited courses on subjects such as cyber-security, would open its doors in Brampton in January 2019, but the status of that target remains uncertain. According to Ryerson, the courses will be offered inside the new West Tower of City Hall, where, coincidentally, today’s council committee meeting is taking place. 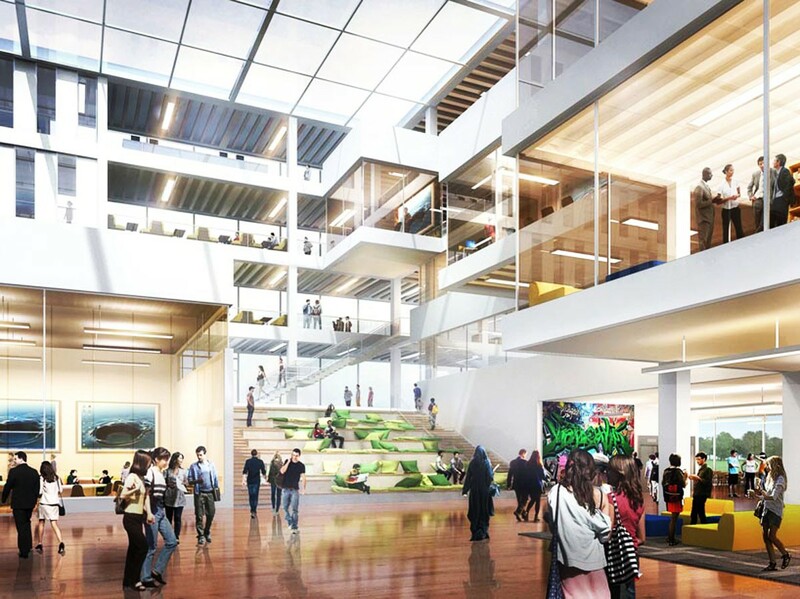 Since October, any discussion of plans for Brampton’s postsecondary institution has been conducted against the backdrop of the Ford government’s decision to pull its $90 million in funding for the multifacility satellite Ryerson campus initially planned for downtown Brampton. The province announced the decision the day after the municipal election put Patrick Brown in the mayor’s chair, citing a $15-billion budget deficit left behind by the Liberal government. Funding for university expansion projects in Brampton, Markham and Milton was cancelled simultaneously, a total of $305 million in commitments. Discussions moving forward will be sure to draw opposing views from councillors on just how the city will cover the $90 million yanked out from under the project by the province. Brown, taking things a step further, has called the funding the bare minimum the province was willing to provide and has tossed around the idea of moving forward with an independent Brampton university. 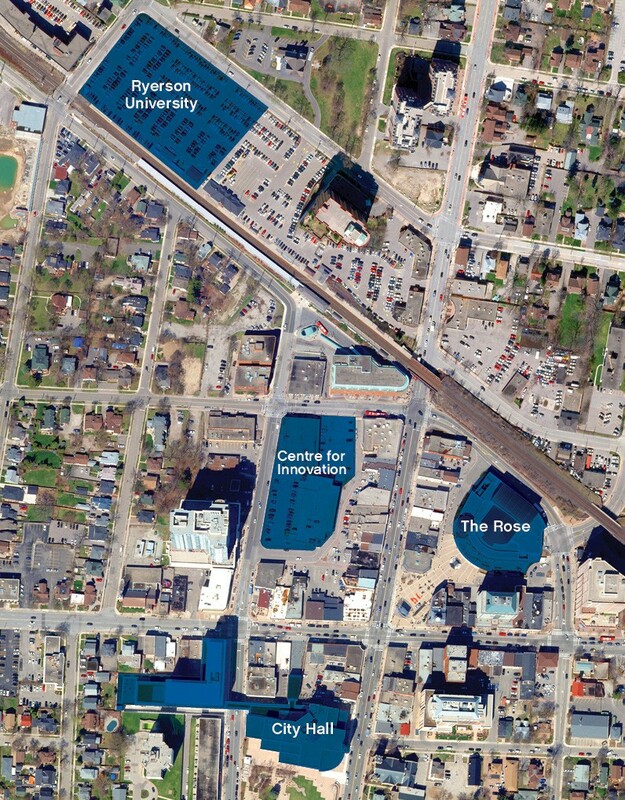 The $90-million shortfall is in addition to the $150 million the city has already committed to the project, $50 million for the university campus (from reserves) and $100 million for the associated Centre for Education, Innovation and Collaboration (planned to be an external loan). Rendering of cancelled Downtown Reimagined plan. 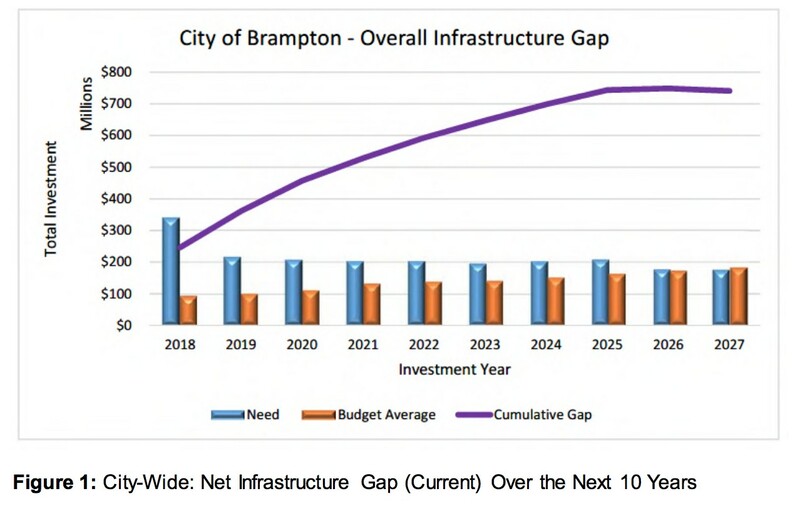 The city’s aging infrastructure has been a hot topic at city hall in the aftermath of a decision to delay the Downtown Reimagined project to improve downtown Brampton. While the city is still working to ensure that all of its assets appear in the plan, it currently encompasses the majority of the city’s property, including transportation assets (roads, bridges), stormwater systems, transit, parks, recreation, culture, corporate shared facilities, IT, fire, library, animal services and the corporate shared fleet. All in all, the list accounts for approximately $3.5 billion in assets with a replacement cost of approximately $5.8 billion. The state of the city’s infrastructure, the overall “good” rating, should be both welcome news and a warning. Overall, that rating is attributed to the relatively young age of most of the city’s infrastructure, more than 50 percent of which has been installed or purchased within the past 20 years. This means that less than 10 percent of the city’s assets, with a value of approximately $489 million, are considered to be in “poor” or “very poor” condition. With the majority of the city’s aging infrastructure relatively youthful, that’s good news for right now, but as those assets age, it means that more and more of the city’s budget will have to go toward replacing and maintaining them. And right now, the city does not have financial plans in place to adequately fund replacement costs. The city forecasts spending approximately $1.4 billion over the next decade on infrastructure, $953 million of which is slated to come from the property tax infrastructure levy. But it won’t be enough. “This level of investment will result in the cumulative infrastructure gap reaching approximately $743 million by 2027, up from its current level of $246 million,” the staff report reads. This is mostly due to “insufficient investments” for transportation and stormwater services, the report continues. For that reason, staff is calling on council to bump the infrastructure levy contributions. According to the report, an annual infrastructure levy increase of 5.9 percent is required to eliminate the deficit by 2027. “The analysis does not consider expenditures required to address growth in assets, service improvements, or inflation fluctuations, nor does it consider new revenue streams, and/or increases to revenue streams from other levels of government,” the report says. Measures to deal with the infrastructure gap, if approved by council, will essentially mean approving a budget increase ahead of deliberations in the coming months. With Brown’s desire to freeze taxes, this report is certain to draw discussion when it hits the floor. Given Brampton’s rapid growth, there’s no question local and regional councillors are facing an increased workload, thanks to the growing number of residents they represent. To help councillors adapt to the greater demands of residents, staff were set to present a report late in 2018 on staffing options for council to consider. However, a motion from Councillor Gurpreet Dhillon delivered ahead of that report suggested some councillors didn’t want to wait. It suggested adopting a new “political model” for councillor staffing, effectively adding a new assistant for each member, doubling their staff complement. 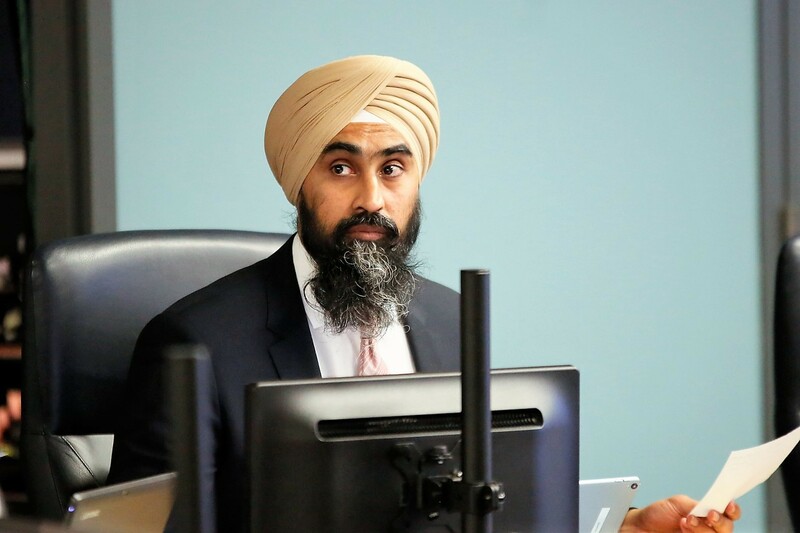 Dhillon repeatedly pointed to Mississauga as an example. The proposed budget for Mississauga’s elected officials for 2019 is $5 million, with seven staff in the mayor’s office and approximately 34 full-time employees split among the 11 councillors there. Dhillon did not mention any other municipalities for comparison. It’s a slightly confusing suggestion, however, as his proposed motion contradicts the city’s 2018-2020 approved operating and capital budget, which recommends no new positions for councillors or the mayor’s office, with an annual budget of just over $3 million for 2019 and 2020. The report was not shared publicly as part of the early agenda; instead, it’s noted that it would be shared ahead of the meeting Wednesday morning. Councillors have expressed differing views to The Pointer, with some favouring the increase and others questioning why it is needed. Others have questioned the cost, noting that there is no more room in the councillor offices for additional staff. Meanwhile, the move seems to contradict Mayor Patrick Brown’s desire for a zero percent tax increase in 2019. As some councillors call for an expansion of their own staffing level, Brown is calling for fiscal belt-tightening across City Hall, and will be bringing international firm KPMG into every city department to conduct a sweeping audit to find cost-cutting areas so that the city’s budget can be trimmed where there is room for savings. An external audit report in 2015 identified over-staffing as the main reason for excessive tax increases in recent years. Many taxpayers have told The Pointer it would be a bad move for council to vote themselves more staff, given the current fiscal climate. It’s a mundane name with serious consequences. The PC government’s Bill 66, Restoring Ontario’s Competitiveness Act, hit Queen’s Park late in 2018 and immediately started to draw concern across the GTA, including from politicians and environmental advocates. The bill, if passed, would allow municipalities to create “open for business” bylaws that could effectively override provincial planning and environmental assessment processes to streamline business growth and create jobs. Brampton city staff have prepared a memo full of questions, concerns and comments with regard to the bill, which will be before council today for review. Among the questions, staff are looking for clarity on certain aspects of the bill and what exactly the bill would allow the city to do. Are they allowed to exempt proposals from all provincial planning policies? What about the relationship with the region; will the bill allow Brampton to circumvent policies in place in the region’s official plan? Meanwhile, last year the city launched a major review of its current planning commitments under existing zoning regulations across Brampton. The aim is to get away from unsustainable sprawl, that has seen the city’s property tax base become heavily off balance, with close to 80 percent of revenues coming from lower return, more expensive residential housing, while more lucrative commercial properties, which should be about 40 percent of a city’s tax base, have stalled in terms of development, and sit at about 20 percent of the overall property tax base. The municipal election campaign last fall had Brown pledging to take back the reins when it comes to development. The sprawling expanses of Brampton’s single-family suburbia for years have been created mostly at the desire and whim of developers, without a comprehensive vision in place. Bill 66 could allow for that to continue unabated. 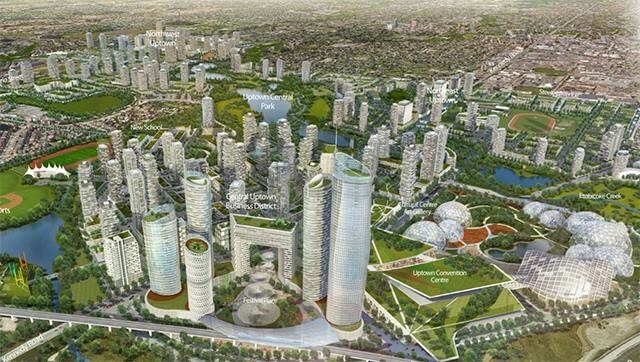 It would run counter to the City’s Vison 2040 strategy (a rendering from the plan is shown above), a comprehensive document put together last year with the input of 13,000 Brampton residents and approved officially by the previous council as the approach to future growth. The strategy calls for more density, with high-rise development across the city for residential growth and commercial activity. It also plans for a major redevelopment of the aging downtown core and high-order transit, either light rail or bus rapid transit through much of the city. Look for staff comments to spark some discussion at Wednesday’s committee meeting on the topic of Brampton’s future growth plan, as 400,000 residents are expected to settle here in the next three decades.